The Lyme Art Association carries on the tradition of Florence Griswold by providing a gallery and juried shows for living artists making representational (not abstract) art. The Lyme Art Association's gallery at 90 Lyme Street, just across the street from the Old Lyme Inn, hosts exhibits of works by some of the region's best representational painters and sculptors. The association's gallery building, on the National Register of Historic Places, is an excellent venue for art, having been designed by Charles Platt, who also designed the Freer Gallery of Art in Washington DC, the Lyman Allyn Museum in New London CT, and other important art buildings. The Lyme Art Association was incorporated in 1914, following more than a decade of American Impressionist shows in the town of Old Lyme. Early exhibitions included the works of Gifford Beal, Louis Paul Dessar, Will Howe Foote, Childe Hassam, Willard L. Metcalf, Henry Rankin Poore, Allen B. Talcott, and Carleton Wiggins. Founding members of the association were the artists who summered in Old Lyme and stayed in Florence Griswold's house next door (now the Florence Griswold Museum): Frank Bicknell, William Chadwick, Harry Hoffmann, Wilson Irvine, Lawton Parker, William Robinson, Edward Rook, and Gregory Smith. The gallery is open to the public for free (closed Monday), and is a prime attraction of this beautiful town renowned for its art and artists. 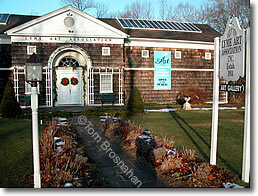 The gallery of the Lyme Art Association, Old Lyme CT.